Want to keep schoolgirls safe? Shoot them in the head. Either those men (not real men). Or the girls. Your choice. You have to pick one. Sorry. Malala Yousafzai was shot in the head by the Pakistani Taliban for the unconscionable crime of promoting literacy. She now tours the world advancing this cause. She’s got more balls than 95% of the male politicians in Pakistan. But unfortunately, what she’s doing barely matters. There are millions of girls in Pakistan that wake up every day with the reality that their school could end before sundown. Yousafzai is an international star, but the Pakistani Taliban remains. The situation is the same across the border in Afghanistan. 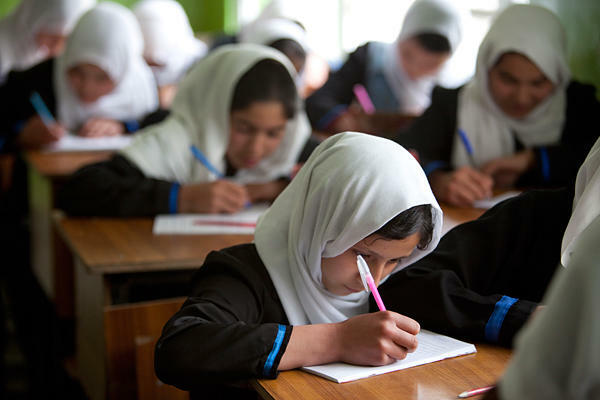 A resilient Taliban has among its broad goals a return to their enlightened days where learning how to conduct basic math was an insult to their honor (not real honor). And in keeping with these delightful themes is Boko Haram. They have an equally emphatic goal to burn down schools and eliminate knowledge. It’s even their name. Like Yousafzai, the abducted girls of Nigeria are now a global cause. Like Yousafzai, nothing substantial is going to come from it. For years, the world chose option (a) with regards to Boko Haram. Despite all the noise of the last week, I assure you, the planet is still choosing option (a). Want to save these girls? Don’t login to a computer program unless you’re prepared to advocate for option (b). Want to support Yousafzai’s cause? Lobby for option (b). You hate the idea of Western “boots on the ground”. You despise war. You are the first to shout at the West when it throws its weight around in the world like a “bully”. You wouldn’t pay $4 a year in extra taxes if it meant funding a UN force in Nigeria. But you’ll get onto Twitter and tweet your support for the girls all day. Sorry, you can’t have it both ways. If you do not choose option (b), you are accepting that you don’t really care. In this case, don’t bother speaking your mind about “your girls”. You’re just a hypocrite who likes to support causes for a while. Until you don’t care anymore, or move onto the next trendy cause that has your support for exactly twelve calendar days. 1) Push your local representative to get a UN or AU force on the ground in northeastern Nigeria. Then push for them to establish an international offensive force to comb the bush until every Boko Haram zealot is shot in the face. 2) Push your local representative to keep a small Western footprint in Afghanistan. Then push for them to make sure that Western footprint enables the Afghani security forces to comb the mountains until every Taliban is shot in the face. 3) Push your local representative to pressure Pakistan to mount offensives into Yousafzai’s homeland until every Pakistani Taliban is shot in the face. Or, do nothing. Or, don’t care. Or, login to a social media program and generate a bunch of pointless words or hashtags. Any of these will result in more girls getting abducted or shot in the head. We spend a great deal of time destroying humanity with our delightfully, brilliant (cynical, asinine) nature. But in the end, people can really shape their future and determine their fate with nothing more than the very best trait we have as a race: the complete inability to ever substantially give up on anything, no matter how bad it gets. We’re not doomed until we accept it as inevitable. For now, we’re battling on. Nigeria is now Africa’s largest economy. In a country so corrupt you can’t buy a bottle of water without bribing a government official the public has made it happen. Don’t believe the folks who will say it’s only about the oil. South Africa’s number one status was also buttressed by minerals. Certainly the oil helps, and is a large percentage of this, but the heart of Lagos is not just petroleum fueled towers. It’s a flourishing commercial and cultural center. Yes, South Africa’s per capita income is still many times larger than Nigeria’s, so in a sense this status is worthless. But these things matter to a country. This is legitimate and well earned. Your government is corrupt, your allies hate you and are leaving, your enemies want to take you back to the year 300, and so when you’re asked to vote what do you do? 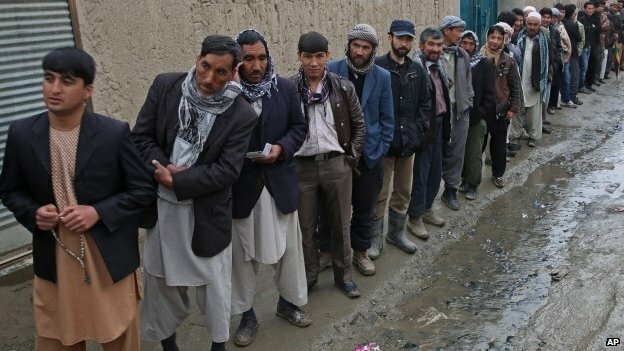 Well, if you’re an Afghan citizen the answer is you vote. You make a statement to the world that you want a brighter future and that you’re prepared to trust democracy to deliver it for you. Based upon the results of past elections, any rational human has no reason to expect this election will deliver the promise of a brighter future. And yet there they are. Defiant, hopeful, and brave. It’s awesome to see and one hopes this time the result is different.